In 2005 the Mozambican government appointed Peace Parks Foundation to provide assistance with a community development strategy that would bring about the sustainable economic development of communities living in and around Maputo Special Reserve in the Lubombo Transfrontier Conservation and Resource Area through nature-based tourism and conservation enterprises. We currently execute this responsibility through two specific collaborative endeavours – the Community Development Facility and the Mozbio Project. In 2013 the Community Development Facility (CDF) was launched as a joint initiative between the government of Mozambique, COmON Foundation and Peace Parks Foundation. The CDF enables both foundations to capacitate and develop the Lubombo Transfrontier Conservation and Resource Area. Funding goes towards developing key aspects of Maputo Special Reserve, as well as creating opportunities; conducting training; building capacity; improving livelihoods and ensuring sustainable natural resource use for poor, vulnerable communities living within and around this protected area. This is being achieved through various projects, which include reserve revenue distribution, reproductive health and livelihood projects such as chilli farming, honey production and conservation agriculture. One of the first projects to be completed was the provision of fresh drinking water to nine communities, comprising 2 300 people and their cattle. Pumps linked to solar panels are used to pump the water. To manage the water-supply project, a water management committee was established for every borehole. 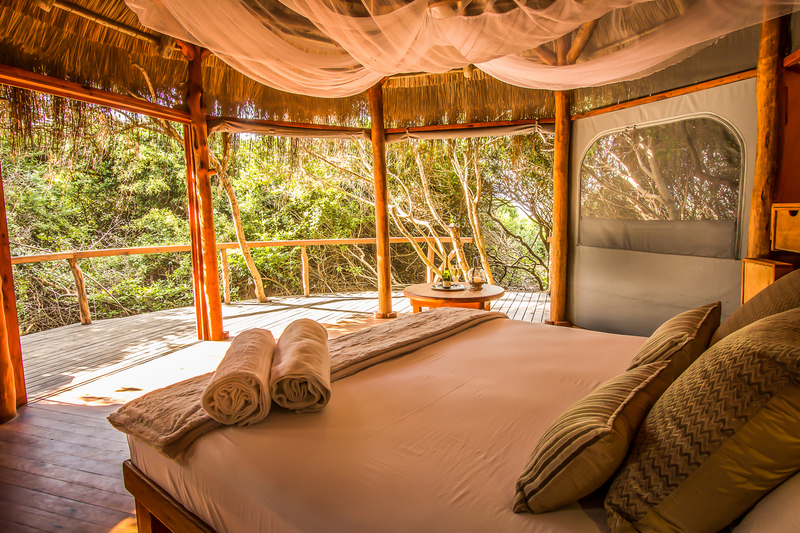 Anvil Bay is a private and exclusive barefoot beach camp on a rare untouched stretch of coastal wilderness in Mozambique’s Maputo Special Reserve. The resort is owned by the local community and operated by the Bell Foundation – a trust established for the community’s benefit. This is the outcome of the Mozambique government’s landmark decision to grant the Chemucane community an ecotourism concession in the Maputo Special Reserve. Anvil Bay beach camp has already created benefits for the community in terms of skills transfer, construction and hospitality jobs, and the purchase of local materials, produce and services. In an area with little previous economic opportunity, a sustainable enterprise now exists. The lodge employs 31 workers, 29 of whom are from local communities. The bar, restaurant, housekeeping and logistics are managed by local community members who received their training at the SA College for Tourism thanks to funding from the CoMoN Foundation. Created with the smallest possible footprint to preserve the wilderness and special sense of place, the eleven accommodation units are nestled in the canopy of the coastal forest, just a few steps away from the secluded white sand beach. The units blend natural materials and local craftsmanship with simple functional furnishings and fine linen. The thatch and canvas design takes advantage of the cooling ocean breezes, while outdoor lighting has been kept to a minimum in order to better see the majestic African night sky and so as to not disturb the turtles in nesting season. Farmers involved in commercial chilli farming have greatly benefitted from this initiative. Within the Tchia community, 33 families with 165 beneficiaries are involved in an irrigation scheme; and in Matchia, 19 families with 95 beneficiaries participate. Through technical assistance from Piri-Piri Elephant Mozambique, farmers paticipating in the chilli project were trained in good practices for soil management, seed bed preparation and management, planting, fertiliser application, disease control and post-harvest quality control. A second seedling nursery was established and the chilli project was extended from three to seven hectares. An agricultural extension officer, with experience in chilli production, was appointed and a better price was negotiated for the harvest. Crop rotation between chillies and potatoes was also started, to provide communities with a year-long harvest, while ensuring food security and the sale of surplus crops. 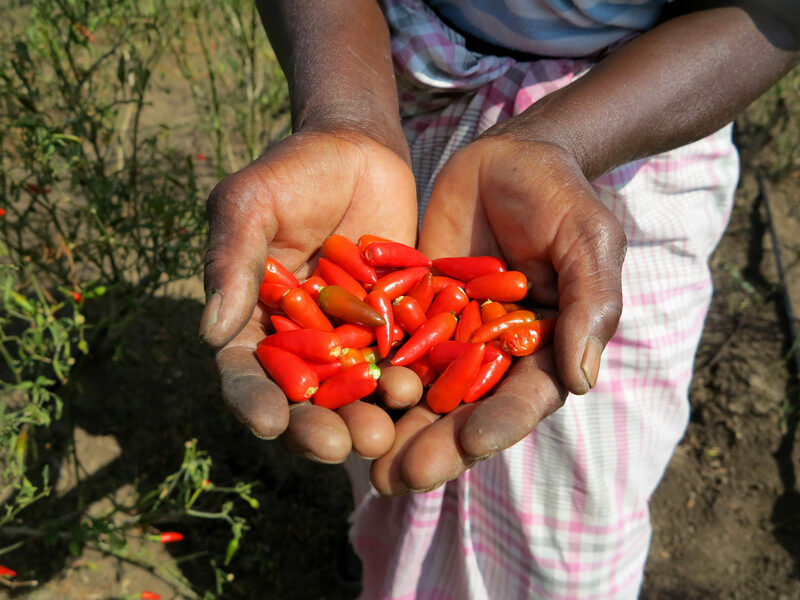 Many of the chilli farmers now have bank accounts, brick houses, are able to send their children to school and even provide employment to other community members. 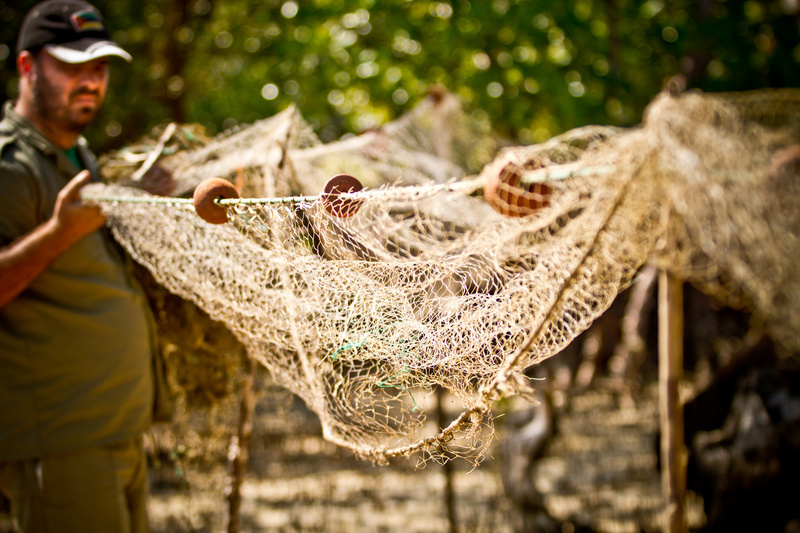 The communities utilise an area of approximately 6 ha for vegetable production, with an additional area under shade netting set aside to nurture a variety of seedlings. The community was trained in pests affecting crops and which pesticides to use. A sustainability plan has been drafted to schedule production and increase community ownership for the 35 families (175 people) in the scheme. Altogether 314 families from nine different communities participate in conservation agriculture, successfully generating higher yields on smaller plots. Three villages and a total of 64 families are involved in a beekeeping project that see them manage honey production from 270 beehives. All the members members trained in production techniques. To assist with project implementation and monitoring, Peace Parks Foundation partnered with SEPPA, a local Mozambican non-profit organisation, who conducts site visits twice a month and assists with bringing the honey to market.. To further promote community engagement and communication, community members who have proven their commitment and interest in the project have been appointed as beekeeping activists and team leaders. 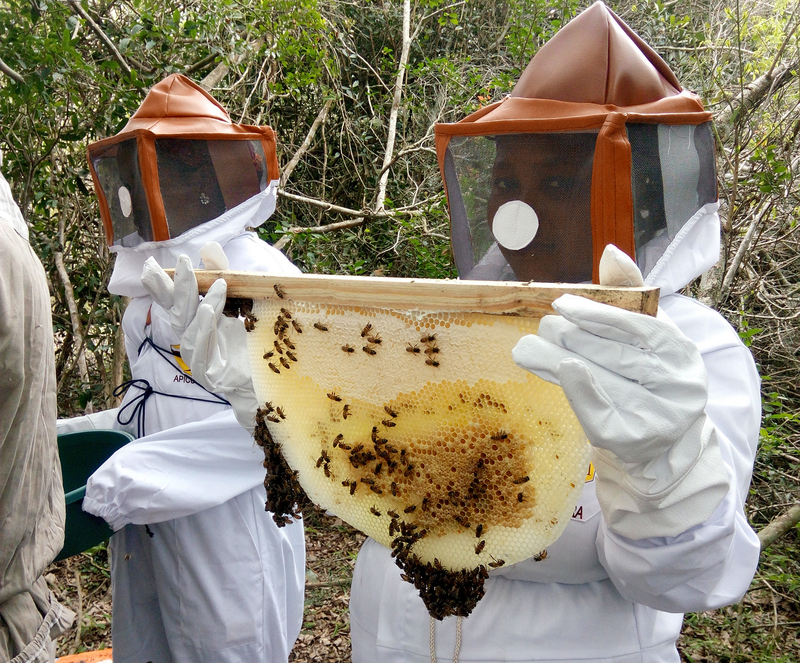 These activists now provide technical support, motivation and leadership to other beekeepers. They serve as a liaison between SEPPA and the beekeepers, and actively monitor honey production per community. In 2016, Peace Parks Foundation embarked on a journey of discovery to learn as much as possible from Blue Ventures, a UK-based conservation agency that develops transformative approaches for catalysing and sustaining locally led marine conservation. The organisation recognises complex links between poor health, unmet family planning needs, food insecurity, environmental degradation and a vulnerability to climate change. This collaboration led to the development of a detailed strategy to ensure that communities in the Lubombo TFCA gain access to family planning services and contraceptives and are informed about their reproductive rights. The process identified the need for the appointment and training of community-level champions, or so-called activistas (community health workers). With the initial strategy as a solid roadmap, AMODEFA, a Mozambican-based non-profit organisation that specialises in community health projects, was appointed mid-2017 as an implementation partner. With support from Peace Parks Foundation, they are responsible for training and supporting 15 activistas as community health representatives. Peace Parks Foundation has entered into a contract with Centro Terra Viva to research the extent of artisanal fishing in Maputo Bay, thanks to support from Fondation Ensemble. The project was introduced to the Machangulo Community Fishing Association, with a request to identify candidates who could monitor fishing catches. A first introductory meeting was held with community councils to explain the objectives of the project and obtain guidance on its implementation. As a first step in determining sustainable fishing limits, meetings were conducted with the community fishermen to determine quantities of fish acceptable for household consumption, especially in the lakes inside the reserve. It was decided that fishermen have to register with the Fishing Community Council and obtain a fishing license. Four monitors have been appointed and trained and the data collection process is under way. The monitors will provide data on current fishing practices to guide the development of a fishing management programme and alternative livelihood projects. 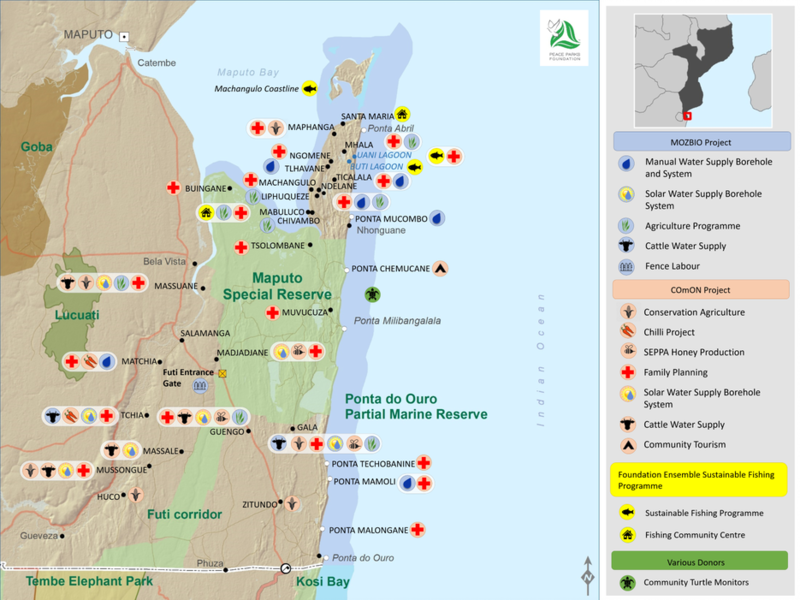 In November 2015, Peace Parks Foundation in partnership with the Joaquim Chissano Foundation won the World Bank’s Mozambique Conservation Areas for Biodiversity and Development Project (Mozbio) bid as service provider to, over a three years period, support the development of projects to enhance the livelihoods of communities living adjacent to Maputo Special Reserve and Ponta do Ouro Partial Marine Reserve. Following a formalised community and district consultation process, the first project was approved. It will include the installation of various community water systems and the development of livestock and agriculture projects around these systems. The project will also incorporate community awareness programmes, using theatre and radio. 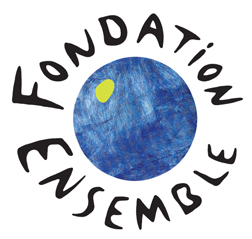 Fondation Ensemble supports sustainable fishing and alternative livelihoods in the Ponta do Ouro Partial Marine Reserve in Mozambique. World Bank supports community development in Mozambique through MozBio, as well as contributes to the development of Limpopo National Park.